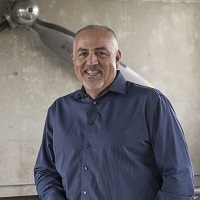 Frank Saucedo, as Director of GM Advanced Design, California, is responsible for an advanced team whose focus is strategic scenarios and initiatives generating architectural and technological solutions for multiple brands. Frank’s first position was with Opel in Germany, where he started as a Designer and went on to become Chief of Opel’s first Advanced Design Studio. Upon returning to California he took a position at the former GM Advanced Concepts Center, and later joined the Volkswagen Design Studio, where, as Chief Designer, he worked on development of the Polo, Passat, and Micro Bus concepts. In 1999, General Motors invited Frank to open a Design Studio in California. Today, GM’s Advanced Design Studio in Los Angeles employs a staff of over 70. Frank’s portfolio includes a variety of Opel vehicles, including the 4200 Corsa, Astra, Omega and Tigra. At GM Advanced Design, the Borrego, Pontiac Solstice, Chevy SS, ULC concept, Chevrolet Code and Tru, GMC Granite, Cadillac Ciel, and Elmiraj, Chaparral 2X and the ZH2 Chevrolet fuel cell concept. Frank holds a BS from the Art Center College of Design in Transportation Design.